It’s 9:00 a.m. at CO+LAB, a web-development shop that values simplicity in design. (Believe us, we know. They revamped our website last year.) You can see programmers are in the zone, coding away with head phones blaring. Others are in prep mode for that day’s slate of meetings, filling the room with the excited chatter of collaboration. The team has a knack for reining in all the possibilities of what a website could be down to what it really needs to be to connect to an audience. 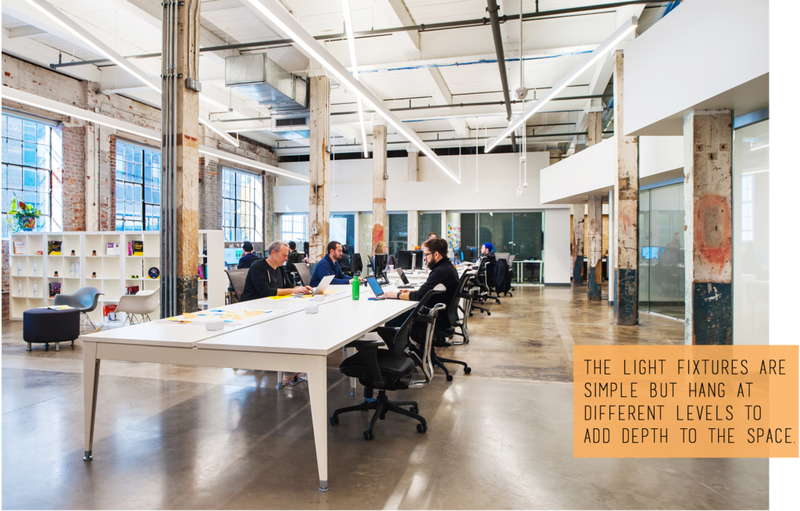 That process of focusing on what’s necessary versus what’s nice to have is exactly the same principle CO+LAB adopted when planning their new office. Suddenly it’s meeting time and the team gathers within the brightly-lit, open space to exchange ideas before a productive day. The vibe in the office is always transitioning between quiet and focused to open think tank. And that’s the beauty of CO+LAB’s new space—it’s straightforward enough for people to be heads-down with no distractions, but it’s also bold enough to inspire big ideas with plenty of collaborative work spaces. 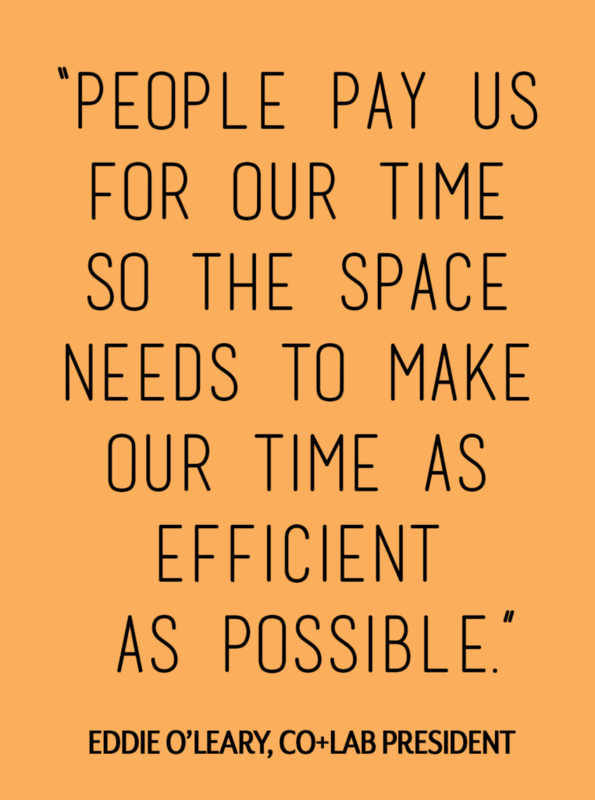 “In our industry, it’s really easy to cubicle up and live in your own little closed-off reality. That attitude permeates with people’s perceptions of what it’s like to interact with technical people. We want to be the opposite of that,” says Eddie O’Leary, CO+LAB president. The design strategy was simple. Decide what tools they needed to maximize the client experience, and build the design around them. The list included super fast Wi-Fi, plenty of power outlets and, of course, tons of free wall space to post in-progress projects and user studies. It took a conscious effort not to overdesign the space. Even decorative items serve dual-purposes. Some CO+LAB folks bike to the office. 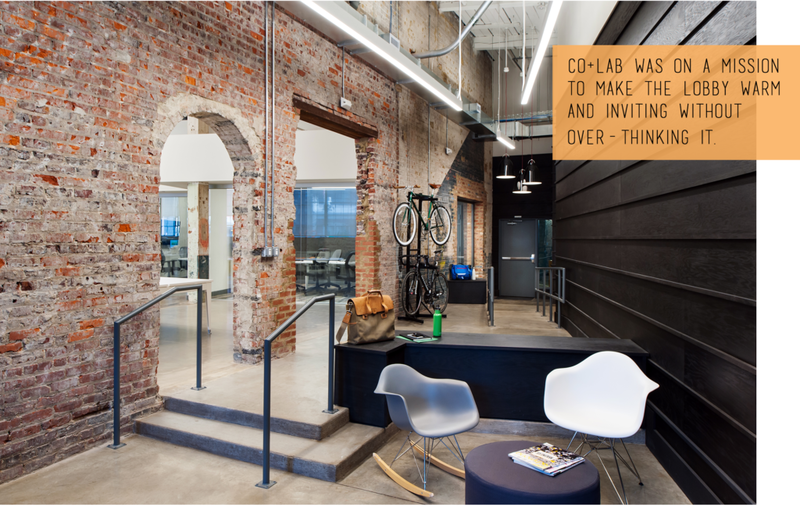 So, why not incorporate strategically placed bike racks to act as an edgy focal point of the design? Such subtle touches let the building’s unique characteristics shine. “Even in web development, there’s a tendency to overdesign things for the sake of doing it, but straightforward concepts are necessary to make a design work and be really effective,” says Eddie. Formerly home of Reynolds Packaging Group’s foil manufacturing plant, the building retains some of the original industrial features. Exposed metal beams with speckled browns and burnt oranges come alive against solid white walls and modern furniture and lighting. “We decided to be really bold with the lights since the rest of the design was so minimal,” says Matthew Marsili, the project’s lead interior designer. Deliberate simplicity is no easy task. There were moments when the team had to step back and re-evaluate their decisions. This included the lobby, which was initially going to feature an accent wall with a textured wood. Instead, the team used clean and sophisticated dark panels. The core of CO+LAB’s design DNA can be seen around the fringes of the open office space. You can’t miss the flurry of brightly colored Post-It notes, tacked along a perimeter of transparent meeting rooms, full of scribbled lessons learned, client notes and new ideas. Employees can share what ideas are brewing, while clients get a peek at the caliber of work the development shop is capable of. Technology is always changing and evolving, and so is CO+LAB. The simple, open-ended design promotes an environment Eddie considers to be a creative safe space–where all ideas are welcome and programmers are encouraged to go beyond their comfort zones. The walls are a blank canvas; art comes in the form of idea boards, word clouds and punchy graphics. The result is a space with timeless qualities with the necessary room to evolve as CO+LAB does. 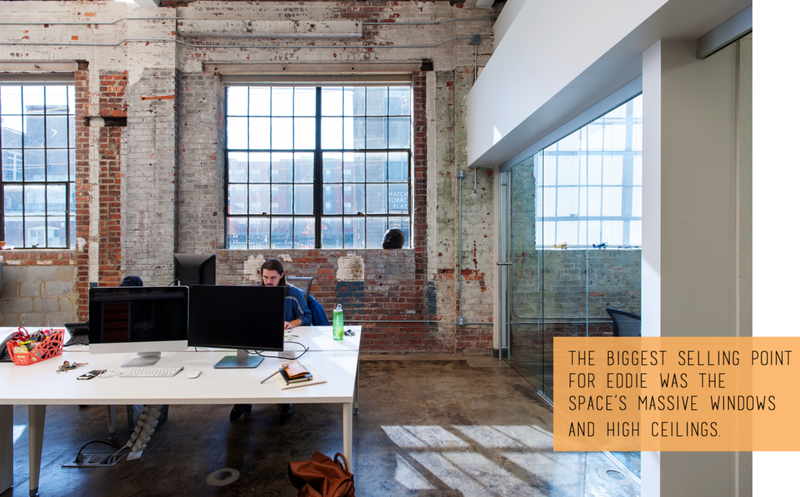 “It all came down to making the space our own while crafting the right experience for our clients,” Eddie says.